endearing. Parents often say the joy and perspective a child with WS brings into their lives had been unimaginable. 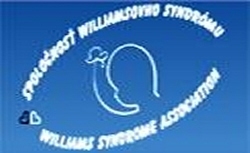 Most young children with Williams syndrome are described as having similar facial features. These features include a small upturned nose, long philtrum (upper lip length), wide mouth, full lips, small chin, and puffiness around the eyes. Blue and green-eyed children with Williams syndrome can have a prominent "starburst" or white lacy pattern on their iris. Facial features become more apparent with age. Some young children with Williams syndrome have elevations in their blood calcium level. The true frequency and cause of this problem is unknown. When hypercalcemia is present, it can cause extreme irritability or "colic-like" symptoms. Occasionally, dietary or medical treatment is needed. In most cases, the problem resolves on its own during childhood, but lifelong abnormality in calcium or Vitamin D metabolism may exist and should be monitored. Most children with Williams syndrome have a slightly lower birth-weight than their brothers or sisters. Slow weight gain, especially during the first several years of life, is also a common problem and many children are diagnosed as "failure to thrive". Adult stature is slightly smaller than average. stiffness (contractures) may develop. Physical therapy is very helpful in improving muscle tone, strength and joint range of motion. Older children and adults with Williams syndrome often demonstrate intellectual "strengths and weaknesses." There are some intellectual areas (such as speech, long term memory, and social skills) in which performance is quite strong, while other intellectual areas (such as fine motor and spatial relations) show significant weakness.